Boy, if you weren't at Hopleaf for Tuesday Funk last week, you missed a great one. On the other hand, it was so packed, you might not have found a seat. 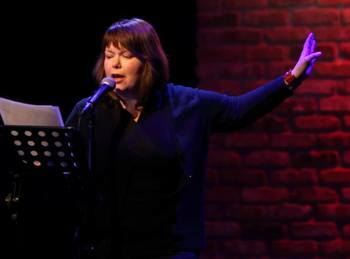 Molly Rafferty led things off with a story of fuzzy feelings at a high school party. Next Rachel Hinton read poetry about cancer and plastic, and Molly Dumbleton shared an excerpt of a short story about a woman returning to her home town to clean out her dad's house and running into old friends. 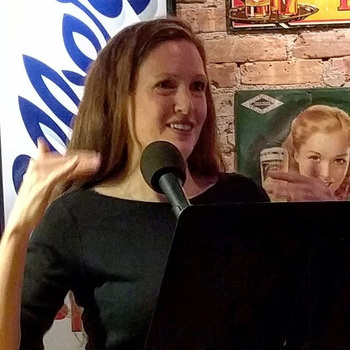 We took a break to refill our glasses, then cohost Andrew Huff read a couple of his topical haiku and Lindsay Porter told a story about how childhood friends change over the years — or don't. Finally, Dave Reidy told the story of his grandfather's greatest triumph. 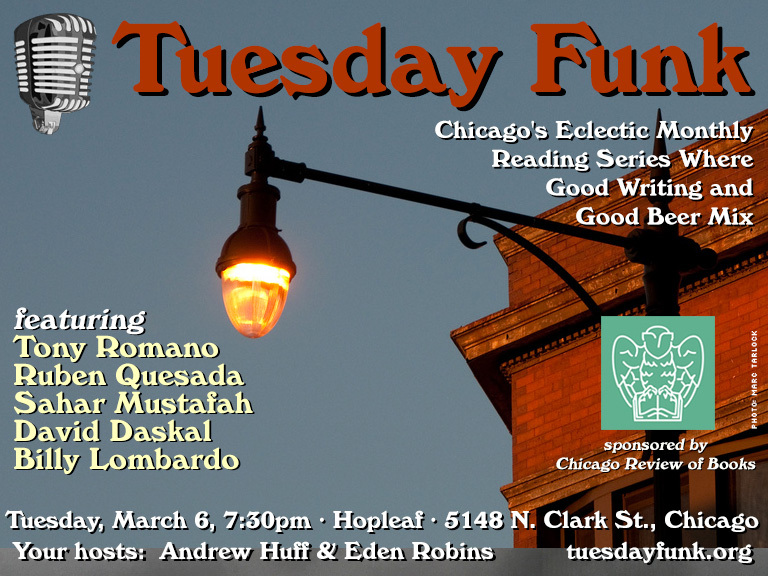 We'll be back at Hopleaf on Tuesday, March 6 for another edition of Chicago's favorite eclectic monthly reading series, featuring Tony Romano, Ruben Quesada, Sahar Mustafah, David Daskal and Billy Lombardo. Hope to see you there! Reminder: Tuesday Funk #113 is tonight! February feels like the longest month, so let's make our own fun! Come to Tuesday Funk tonight for some great readings by Molly Rafferty, Rachel Hinton, Molly Dumbleton, Lindsay Porter and Dave Reidy! Andrew Huff and Eden Robins will, once again, be your spiritual guides for the evening. Lindsay Porter teaches acting and creative writing in hospitals, elementary schools, high schools and colleges, and at the Lake County Jail. 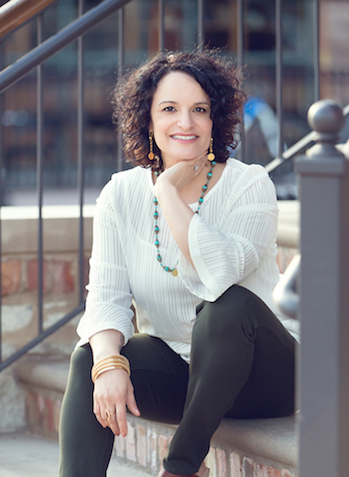 She has written plays that have been produced by Running with Scissors, Chicago Dramatists, Trap Door and Collaboraction Theatre in Chicago and by Live Girls in Seattle and Riverside Theatre in Iowa. She has told stories with Loose Chicks, Upright Citizens Brigade, Story Sessions, Miss Spoken, Tellin' Tales, TenX, and True Story. She recently ventured into the world of stand-up comedy and is searching for an open mic that will allow her to maintain her 9 o'clock bedtime. She lives in Chicago with her husband and son. Please join Lindsay and our other amazing readers on Tuesday, February 6, 2018 in the upstairs bar at Hopleaf. Doors open at 7pm, and the show starts at 7:30. It's free, and 21-and-over. RSVP on Facebook. 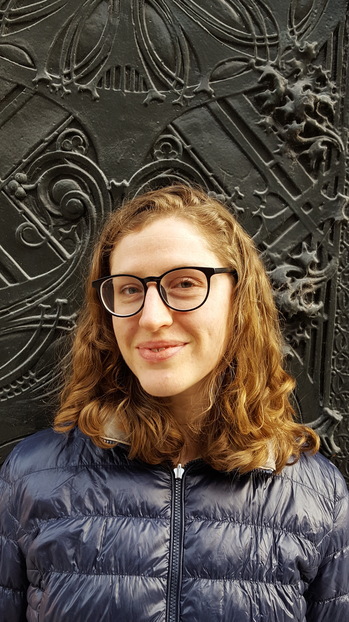 Rachel Hinton is originally from Vermont and now lives in Chicago, where she works as an editor. She also tutors adults in reading and writing, and teaches a class on copyediting as part of DePaul's Writing and Publishing MA program. 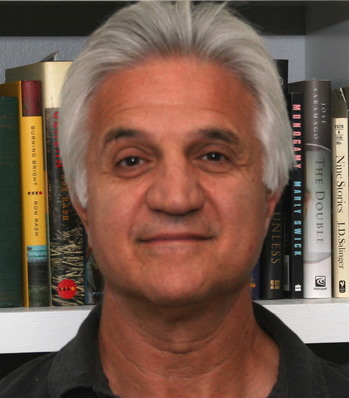 Her poems have been published in Cimarron Review, the Denver Quarterly, SOFTBLOW, and Zocalo Public Square, among others. 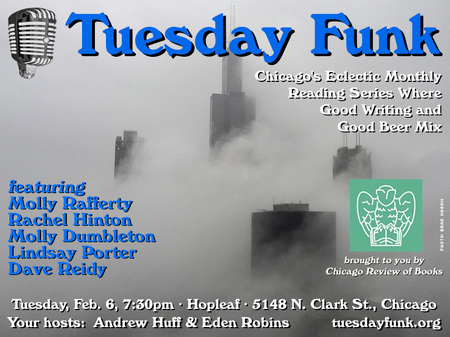 Please join Rachel and our other amazing readers on Tuesday, February 6, 2018 in the upstairs bar at Hopleaf. Doors open at 7pm, and the show starts at 7:30. It's free, and 21-and-over. RSVP on Facebook.